Semtech Corporation (Nasdaq: SMTC), a leading supplier of analog and mixed-signal semiconductors, today announced the addition of dual-mode Wireless Power Consortium (WPC) Qi 1.2 and AirFuel Alliance (PMA) SR1E medium power 15W capability to its TS80000 portfolio of wireless charging solutions. This allows customers to support the growing market of portable electronics with increased battery capacity for quick charging smart phones, tablets, phablets, and medical and industrial devices. 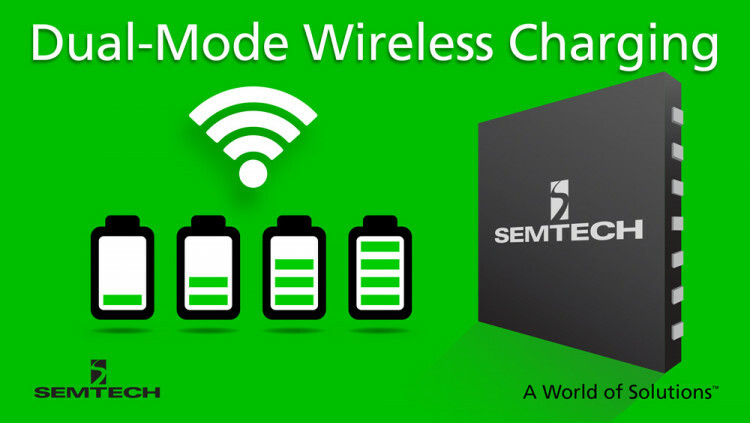 Semtech’s medium power wireless charging technology is in production today and can be easily integrated into existing portable devices as well as infrastructure and automotive applications. The TS80K family of solutions can support both receiver and transmitter applications. Complete reference designs and easy-to-use evaluation kits allow customers to implement the technology into their next generation products with minimal effort. All statements contained herein that are not statements of historical fact, including statements that use the words “delivers,” “designed to,” “provides,” “enables,” “can,” or other similar words or expressions, that describe Semtech Corporation’s or its management’s future plans, objectives or goals are “forward-looking statements” and are made pursuant to the Safe-Harbor provisions of the Private Securities Litigation Reform Act of 1995, as amended. Such forward-looking statements involve known and unknown risks, uncertainties and other factors that could cause the actual results of Semtech Corporation to be materially different from the historical results and/or from any future results or outcomes expressed or implied by such forward-looking statements. Such factors are further addressed in Semtech Corporation’s annual and quarterly reports, and in other documents or reports, filed with the Securities and Exchange Commission (www.sec.gov) including, without limitation, information under the captions “Management's Discussion and Analysis of Financial Condition and Results of Operations” and “Risk Factors”. Semtech Corporation assumes no obligation to update any forward-looking statements in order to reflect events or circumstances that may arise after the date of this release, except as required by law.